When an attempted rescue mission goes horribly wrong, trapping his ex-fiancée as well, he guesses that these events may have been triggered by the emergence of a smarter-than-human intelligence inside Cyberdrome, possibly giving rise to the long-feared, "Technological Singularity." Alek knows of only one way to rescue the people he loves, but will he risk all of humanity to save them? When you finish a good novel, you sit and ponder the characters, the the plot lines, and wonder about what could possibly be next. Cyberdrome gives you that experience. I read this great sci-fi thriller 2 months ago and was waiting for an extended sitting to review this novel properly. I still don't have that kind of time, but I feel compelled to let you know that it's a great read. Like most people, I'm suspect of any first time, self-published authors. Don't let the low price, the fact these are first time authors, or the exclamation point on the cover fool you--this isn't low-brow, juvenile sci-fi. It does make you think (not in that awfully-written "I'm confused" sort of way). The characters, flow, and plot are very well developed. 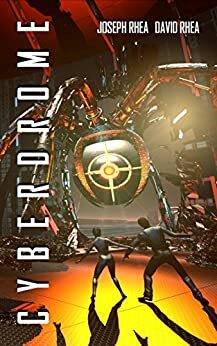 Cyberdrome isn't perfect but what first time author is? I give it 4 out of 5 stars only because "love" is a strong word--I love Arthur C. Clarke, but I sure like the Rhea brothers' first novel and hope to see another (love often springs from "like," after all). If I were rating first time authors, they'd definitely get a 5, as would first-time novelist and Poe award winner Bruce DeSilva (crime thrillers). As for technical Kindle issues, the formating is on par with novels published by large publishing houses. You won't find glaring, distracting type-o's or grammatical errors (unlike my review, I'm sure). All the basic kindle features are in place and functional (excellent table of contents, chapter skipping (back/forward), etc.). Bottom line: If you're a fan of good sci-fi, get it. You won't be disapointed. This book has been compared to Tron and Tron Legacy, but this author knows more about computer systems than the Tron writers ever did. Actually, his left pinky finger knows more about computer systems than the Tron writers ever did. Now, the whole idea of people entering a computer leaves some very hard to figure out questions - what exactly do biological functions like breathing or having adrenaline flood your body really mean when everything is binary code? So ignore those questions. Just concentrate on the really cool things that would look great in a movie, like the monstrous living machines based on praying mantises, worms, and other things. My favorite was "soldiers" that used identical parts to build and rebuild themselves into various forms. I can't say this author knows as much about realistic characters as he does about computers, but his characters serve their purpose. The ending is very much a lead-in to more adventures, and I hope the sequels will explore some of the many simulated Earths on which "people" live and die without knowing they are simulated. We barely get a glimpse of them in this first book. I enjoyed reading Cyberdrome enough to set aside more time than I usually allow myself these days for reading fiction. It's a fun and relatively easy sci-fi read with some complex notions that can leave you pondering your perceptions of reality. I think comparisons to Tron are superficial at best, since Cyberdrome delves much, much more deeply into a logical basis for the interface between the physical world and the cyber environment, whereas Tron basically relies on "science-y sounding magic." The multiple nested worlds of Cyberdrome also provide a much richer setting for the story. I also wouldn't really compare this to Avatar, as the stories and settings are radically different (and, obviously, Cyberdrome did not come out "in the wake of" Avatar since Cyberdrome was released earlier). There are some thin parallels with the Matrix story but, as with Tron, it's only a superficial comparison. Cyberdrome stands strongly on its own and I look forward to reading a sequel. 5.0 out of 5 starsGreat Science Fiction: Matrix meets Tron meets science! Part of my initial interest in this story came from the similarities in base concept to the Matrix and Tron. Humans enter a virtual world to save the lives of real people. Programs that think and evolve on their own. Computer systems represented by a 3d virtual environment. However, this story adds more science-based concepts and doesn't suffer from fridge logic level plotholes. Think you see a plothole? A scientist notices and explains it. This also combines more real-world scientific concepts than the previously mentioned works. Nanobots, the grey goo scenario, genetic algorithms, and metamaterials all make an appearance. Though there are some unrealistic aspects, they are generally kept manageable and don't break suspension of disbelief. I also like how there is an actual reason for the people in the world to exist, and they have their own DNA allowing them to have complex behaviors, unlike the programs in Tron that are able to exist as people and have personalities despite only being made of a few thousand lines of code that should only allow for a very small set of actions based on specific cases. The world is very entertaining, to the point that I devoured this book in 24 hours.... and immediately went looking for more. I was expecting to see a series of novels, with the potential for a highly entertaining cartoon series (special effects would be too pricey for live action... the CGI involved would be on the order of the recent Tron movie). However, what I found was that this was based off of some simulations that the author had created, with the idea of a potential computer game (possibly an MMO) based off of this. I'm eagerly awaiting future developments in this story universe. This story has a huge potential for expansion, all based on what has been defined so far in this one novel. Multiple Earths, people to be rescued, and computers systems to explore. Everything a fan of the cyberpunk genre would ask for.